Robert and Christine Staley met when they were working for the Operation Mobilisation Team in France. When they were back in the UK God called them and their four children to live and witness in Montluçon. As close friends of the Church, we continue to support them in their vision. By running an Alpha Course and personally witnessing, a family came to know Jesus as their Lord and Saviour. 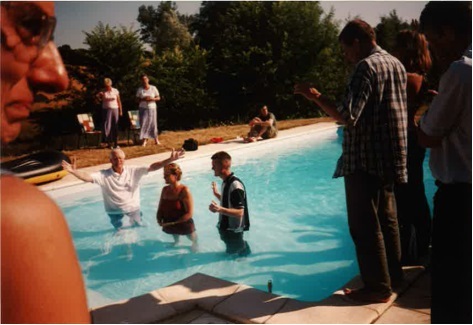 As a result Jean-Michel (a surgeon in a French clinic), his wife Pascale and their teenage children were baptised in their own swimming pool. It was a precious time and God's presence was very real. The work continues with them now running the “Active” group with Robert and Christine continuing to encourage and pray for the needs of those around them.